Danielle was born in Singapore, but her family moved to Vancouver 16 years ago. She does digital marketing for a small local tech company. In her free time, she enjoys riding bikes (her own as well as Mobi by Shaw Go), doing hot yoga, and finding new places to explore - in and around the city! 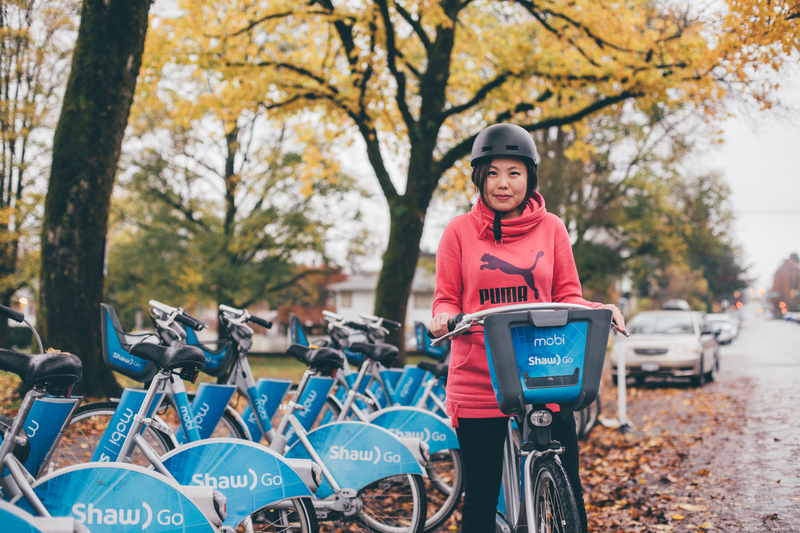 We asked Danielle a few questions about her experience with Mobi by Shaw Go. 1) When was the last time you rode a bike? Today! I actually ride almost all year round, except when it is really pouring out or when the roads are all covered in black ice. It is funny because I actually also love to drive. I usually drive when I have to carry a lot of stuff, or when it is really early in the morning (for my 6 am hot yoga class). The rest of the time, I generally prefer to grab a bike! 2) How do you integrate Mobi by Shaw Go into your daily routine? I use Mobi by Shaw Go almost daily for my commute to and from work. It takes me only 20 minutes each way by bike, versus 25 minutes by car in mild traffic, or upwards of 30 minutes if I take transit. 3) Where is your favourite place to ride a Mobi by Shaw Go and Why? There are too many places I love riding Mobi to! I am fortunate enough to work in the Downtown core and Mobi by Shaw Go stations are a dime a dozen here, so I love riding to work. On weekends, I enjoy riding Mobi to the Vancouver Aquarium in Stanley Park to visit the sea otters. There is a Mobi by Shaw Go station right outside the aquarium, so that is extremely convenient! I also like to ride along the Arbutus Greenway. There are many Mobi stations northbound on the Greenway, but not many southbound. This is where my 60 minute 365 Day Pass ‘Plus’ comes in handy. The Plus Pass allows me to ride the entire greenway without worrying about finding a station to dock further south. 4) What is your favorite part of Mobi by Shaw Go? 5) Do you have any Mobi by Shaw Go tips or tricks? Always reach out to the Mobi team on Twitter if there is a need to report bike malfunctions or any station issue. I have found this method to be much faster than calling customer service or filling out an email form! 6) Words of encouragement for new users? It is so easy to incorporate Mobi into your daily life if you live or work within the Mobi by Shaw Go service area. The bikes are really comfortable to ride! 7) Is there anything else you would like to add? Mobi has inspired me to try out public bike share systems in other cities. It is amazing to see how convenient and fun bike sharing can be - both when I am in my home city and also when I am travelling!